We gather today to celebrate the life of Sister Leona Michiels who died peacefully on the evening of January 17, 2015, in the Maryknoll Home Care IV, surrounded by several of her Maryknoll Sisters praying with her. Sister Leona was 97 years old and had been a Maryknoll Sister for 76 year. 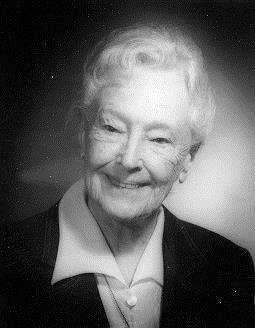 Leona Maria Michiels, who later added her confirmation name, Teresa, was born on November 8, 1917, in Chicago to Leo P. Michiels and Leona M. Syoen Michiels. She was the oldest of ten children. Her niece, Joan McCullough, who resides in New Jersey, was very devoted to Sister Leona and faithfully and lovingly spent long hours with her during her final days. Leona, a precocious and intelligent student, graduated from Immaculata High School in 1935. From 1935 until December 7, 1938, when she entered Maryknoll, Leona attended Mundelein College in Chicago. She completed her studies for her Bachelor’s in Biology in 1942 at Manhattanville College, New York City. Sister Leona later secured a Master of Science degree in 1965 from Temple University in Philadelphia. She also spent the summers of 1959, 1960, and 1961 taking special courses in Education at the University of Hawaii. Sister Leona, who retained her baptismal name at her Reception, made her First Vows on June 30, 1941 at the Maryknoll Sisters Center, New York, and her Final Vows on June 30, 1944 in Hawaii. Sister Leona was assigned to Hawaii in 1943, where the Maryknoll Sisters at the time were responsible for ten of the Catholic schools in the diocese. She served at St. Anthony School in Wailuku, Maui, as a junior and high school science teacher until 1959 when she was transferred to Maryknoll School in Honolulu, for one year, as the physics, algebra and geometry teacher. In 1960, she served as the science teacher at St. Ann’s School in Kaneohe on the island of Oahu. Sister Leona was an excellent science teacher, much appreciated by her students. Her knowledge of biology also made her a favorite with visitors who came visiting the islands. She enjoyed taking them on tours of the grounds replete with exotic Hawaiian plants and flowers, which, to the delight of the visitors, she could identify at length giving their botanical names as well as their genus and species. In 1965, Sister went to Helen Herlihy Hall in Mexico for language study, where she very quickly became quite proficient in Spanish. She then served in Guatemala until 1969. She was then recalled to the United States for Promotion and development work until 1971. She returned to the Hawaii Region where she was re-assigned as the science teacher at St. Ann’s School. Her stay was brief and she returned to the Center in 1973 where she served as infirmary driver. Her Health Services Coordinator, Sr. Katherine Byrne, wrote, “She has done a very good job of coordinating patients and trips and she has done a miraculous job in keeping an old car in good condition and on the road.” In 1976, Monrovia was in need of a driver and Sister Leona responded to that call. In 1981, Sister Leona began a new work at the Center, the Stamp Department. She loved this work, which put her in touch with people all over the world; she felt she was doing something truly worthwhile for her Sisters since all the monies derived from this work were earmarked for the Nursing Facility. In 1983, Sister Anne Callahan, treasurer at the time, wrote, “The revenue received from the Stamp Department is greatly appreciated…. the contribution from the Stamp department is certainly and sorely needed.” Sister continued in this work until she was 93 years old in 2010, when she requested a transfer from the Rogers to the Eden Community giving as her reason, “so that I may participate more freely int he community where I live.” In Eden, her coordinator remarked, “Sister is very attentive to some of the residents who live near her.” All her life Sister had shown a special predilection for the sick and the handicapped, some of whom depended on her for attention, encouragement and companionship. Today, we gather to say goodbye to Sister Leona who delighted to be able to work for her Sisters, and we thank her for her life. We are happy to welcome with us here today, besides her niece, Joan McCollough, Joan’s daughter, Julie, Leo Michiels, Sister Leona’s nephew from New Orleans, and two nieces, Mary Armone and Monica Frederick, both of California. We also welcome our Maryknoll Brother, Father Wayman Deasy, who will preside at this liturgy of Christian Burial.